Camping – one of the world’s favorite pastimes. No matter whether you prefer to camp in the backwoods of a deep forest park or the not-so-remote area of your own backyard, you will likely find yourself in need of two things (besides the tent, of course). You will need a good, warm sleeping bag, and a camping partner. If you’re camping, there is no better way to share the experience than to cuddle up with your partner in a cozy double sleeping bag. A double-wide sleeping bag is not only more practical, as it helps you to conserve body heat, but it’s a lot more cozy, too. If you’re in the market for the best double sleeping bag, consider our review of the Tandem by Coleman. This double sleeping bag has a unique 3-in-1 design that allows it to be zipped apart into two separate sleeping bags if the need arises. 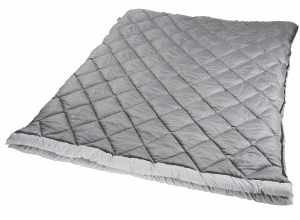 It is stuffed with Coletherm hollow polyester insulation, a unique Coleman feature, that allows you to stay warm in temperatures down to 45 degrees Fahrenheit (and this isn’t factoring in body heat from your sleeping buddy, either). The bag also has a “ComfortCuff,” which encases the back of your head in soft, warm fabric so that there is no need to tote a pillow. It even has an additional built-in detachable sheet to provide additional layering options. A blue removable liner makes it comfortable to use in warmer weather, and also easy to wash in a standard washing machine. You won’t need to hand-wash it. The sleeping bag also comes equipped with a unique ZipPlow system, which pulls away fabric to prevent snagging during zipping. If you’ve ever found yourself struggling to zip up your sleeping bag in the middle of the night, growing more frustrated by the minute as the material bunches and rips, then this sleeping bag is a good choice for you. No frustration here! Finally, this double sleeping bag has a Roll Control design and Quick Cord system. While this terminology sounds fancy, it essentially just means that the bag comes with a convenient way to store your gear. It comes with an additional stuff sack to make it easy to roll it up, fasten it, and carry it with you wherever you go – the bag even has a carry handle. When rolled up, the bag is about fifteen inches tall, fifteen inches long, and twenty-two inches wide, and weighs less than ten pounds. This sleeping bag has received rave reviews from customers, (see reviews Here) offering a nice, soft, classic feel with the convenience of a more modern sleeping bag for two. With excellent longevity – most customers report being able to use it for multiple years in a row – and its ability to withstand even the harshest washing conditions, it is a great choice for a couple seeking a cozy double sleeping bag option. Tall camping enthusiasts, rejoice – if you are over six feet tall and have a hard time finding a suitable double sleeping bag (or if you simply prefer more leg room), then this sleeping bag is for you. It can accommodate most individuals up to 6’4” in height, with one size fitting most couples easily. While the size of this sleeping bag is its major attraction, other customers have marveled at the fluffy and insulated bag’s warmth and comfort. It has also received top reviews for its durability and ease of use, with customers appreciating how quick and easy it is to zip apart the single bag into two separate bags, s well as to unzip the additional sides. 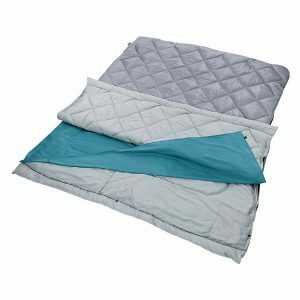 It is perfect to use on a queen bed or air mattress, and even better for using during tent camping since it is so easy to tote, store, and carry. This is easily one of the best sleeping bags on the market. While not designed for extreme cold conditions, it fits most other applications perfectly and provides the opportunity for additional layering. This double sleeping bag is a good budget-friendly option that can be carried while hiking, backpacking, and other types of exploring, practically without you realizing it is there. With plenty of options for how you use this sleeping bag – double, single, or switching it up as you go – the Tandem by Coleman is a good option for finicky campers. If you are ready to make the leap from a single-person sleeping bag to a double, then this double sleeping bag is the right pick for you.